THE STORY - Preparing for Wimbledon in the summer of 1980, four-time cool and collected champ Björn Borg faces off with the ruthlessly abrasive newcomer John McEnroe to battle for the history-making world title, culminating in what is considered one of the best tennis matches of all time. “Borg vs McEnroe” follows the journey to the 1980 Wimbledon tennis championship, recounting the visceral experiences of two rival players. On one side, there’s Björn Borg (Sverrir Gudnason), a veteran Wimbledon athlete with four back-to-back trophies under his belt. He’s mechanical and simmering with unseen emotion— a pure and unadulterated “sledgehammer” of a tennis player. On the other side is the American newcomer John McEnroe (Shia LaBeouf), whose made a name for himself via public outlashes of dissent towards both the usher of the game and his viewing audience. He’s loud and unfiltered but profusely talented, known as the “stiletto” to Borg’s “sledgehammer.” As the two men trek towards their final showdown, “Borg vs McEnroe” showcases how their past led to their present, and more than anything, how stress integrates itself in the human psyche like a parasitic disease. Janus Metz, whose previous work includes a directorial credit on the critically acclaimed HBO series “True Detective,” as well as helming the Cannes Festival darling “Armadillo,” is no stranger to producing a medium of film infused with heavy thematic elements. Metz is a documentarian at heart; 2010’s “Armadillo” saw him follow a group of Danish soldiers into the heat of Afghanistan’s war-torn nation. His documentary received both praise and controversy, as he explored the psyche of average men thrust into a violent environment of bloodshed and uncertain moral parameters. With “Borg vs McEnroe,” Metz utilizes this cinematic background in documentary filmmaking to produce a work seated in vigor and raw authenticity. Metz may be recreating a historic moment, but he accomplishes much more than the average biographical docudrama. The tone is immediately set from the first few shots of the film— we see Borg in his lavish Monaco home, soft-spoken and expressive in the way his eyes evaluate his surroundings. This is juxtaposed with McEnroe, whose first scenes (Shown before a late night talk show appearance) expose him as corrosive, grating, and vehement towards those around him. These two men were known as “Ice and Fire” opponents by the media, and Metz, along with his cinematographer Niels Thastum, exploited this metaphor to its full extent. Scenes with Gudnason’s Borg were colored in pastel cool tones, while LaBeouf’s McEnroe was exposed to warm, flushing filters. Utilizing these muted color schemes also lends well to the film’s nostalgic 80s time period. Parallel to this is the film’s score, which heightens the stakes and adds a devastating sense of importance to every game, set, and match. Composers Vladislav Delay, Jon Ekstrand, Carl-Johan Sevedag, and Jonas Struck invite the listener into a thrilling and transfixing ride which will refuse to let you go, even in the most benign of scenes. The film’s music adds depth and provides a welcome background for the intense performances. With subtitles present through nearly half the runtime, “Borg vs McEnroe” could almost be considered a foreign film. While to some actors this may have proved challenging, the cast of “Borg” didn’t notice. Both Stellan Skarsgård and Tuva Novotny provide a healthy support to their Wimbledon champion as the vicarious trainer and the dedicated girlfriend, respectively. Sverrir Gudnason is rippling as the stoic and languid Borg, whose entire life’s goal was to become the “best in the world.” Being the best comes with a price, as he’s also described as being the “loneliest” man in the world. Gudnason is subtle in his execution of emotion and relies heavily on facial expressions and physical tensions to portray anything more than a man made of stone. He succeeds— we feel for this tennis goliath, and it’s evident he’s sacrificed more than most would dare. However, “Borg Vs McEnroe” belongs to Shia LaBeouf. In what could be considered his greatest performance to date since 2014’s “Fury,” LaBeouf is clearly tackling a role close to the chest. The similarities between the real-life John McEnroe and Shia LaBeouf are impossible to neglect; both are sheathed in controversy, media scandals, and tales of bad behavior. Scenes of McEnroe pleading to the press to see him for his talent, and not his personal life, hit a chord— if LaBeouf is using this role to reflect upon his own past with fame, it’s working. He devours McEnroe with a wholehearted carnivorous glee, chewing into his temper tantrums and obsessive tendencies like a rabid animal eating its first meal. 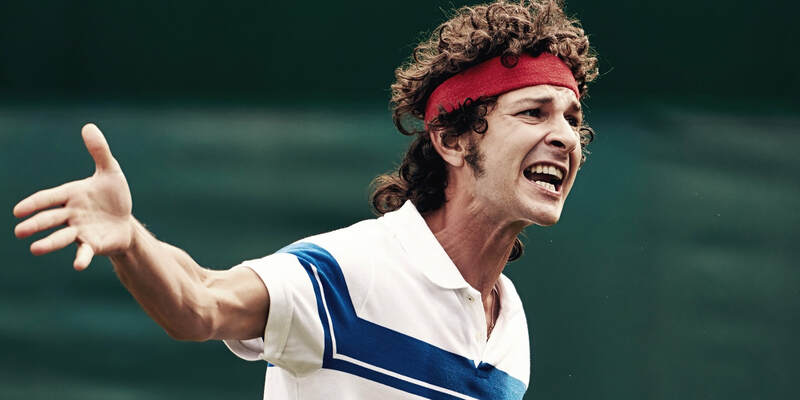 Granted, as hard as LaBeouf and Gudnason may try to keep “Borg vs McEnroe” grounded in reality — which they accomplish for 3/4 of the film — the last act is dripping in cliché recalled dialogue and an overkill of melodrama. It’s unfortunate because even though Ronnie Sandahl’s screenplay isn’t endorsed by their real-life counterparts, it’s a mostly well-written and realistic look into the two men’s lives built on the game they love. While not in the least revolutionary, “Borg vs McEnroe” gets to the root of stress and how it manifests in many different ways, both outward and inward. An otherwise unrelatable story about two tennis greats becomes an eloquently practical reflection on human development, “Borg vs McEnroe” might just surprise you.